The Prospector needs your help in keeping bandits away from his gold mine. Click here to play! The Gold Rush has just started and everyone has gold fever! Mines are springing up all over the west! The Prospector has a claim that is starting to pay off big time with gold nuggets as big as your fist. Word has spread of the Prospector's success and bandits are showing up from all corners trying to get their hands on his gold. You need to stop them and help the Prospector mine his gold. Like any good miner knows, you need to keep your eye out for the Golden Nuggets. These nuggets only appear on reels 2 and 4 during normal games, but they will triple your prize if they appear in a winning combination! Find two or more Mine Sites and you'll get up to 10000 times your original line bet (30000 if a Gold Nugget appears). Five Prospectors pays out 2500 times your bet. Watch out for the Bandits. They're sneaky but if you can manage to catch five of them, you'll get 1000 times your bet. There are also plenty of other characters to help you collect a golden fortune. Keep an eye out for Donkeys, Mining Carts, Dynamite, The Prospector's Pooch and many more. If you hit Paydirt! you have a chance at three different bonus features that will reward you with free spins and multipliers. Grab a gold pan and a six shooter so that you can help the Prospector and collect a fortune of your own. Two or more PayDirt! Signs anywhere on the board will pay out up to 200 times your total bet. Three of these signs anywhere on the board will trigger a feature in which you choose a sign to reveal what type of feature you will play. The first two, Gold Rush and Gold Fever, will reward you with number of free spins. In the first, Gold Nuggets can appear anyhwere on the board. In the second, Gold Nuggets fill up reel 3. The shimmering Gold Nugget acts as a substitute symbol. It appears on reels 2 and 4 during normal games and subtitutes for all symbols except the scatters. 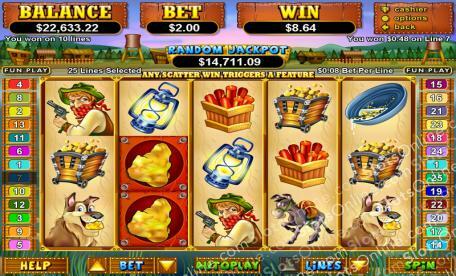 Prizes are tripled when a Gold Nugget appears in a winning combination. There are three bonus games in Paydirt! All three are activated when three or more Paydirt signs appear on the board. You one of the three signs to reveal which game you will be playing. Strike it Lucky is an 'off the reels' bonus game in which five mines are revealed. You select one to reveal a bonus prize. Additional picks may be awarded if your selected mine reveals an extra bonus symbol.